Nor should you try! If you want fans of your writing and your content, you're going to have to have people that disagree with you, not just neutrals. If they're neutral it means they don't really care all that much. They say the US military have a manual for everything, it may be true with their recent infographic outlining how US Air Force personnel should engage with bloggers. 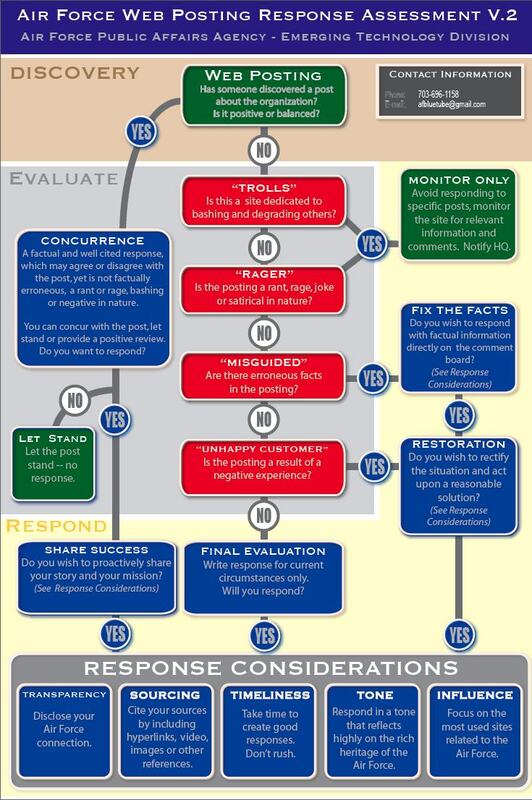 Although it was created to clarify how people in the organisation should handle negative stories, posts and opinions that they find about the USAF, it's still very helpful. They wisely differentiate between types of unideal posts. Are they from someone who is reasonable and simply states a case of an opposing viewpoint sticking to the facts or are they highly emotional, ranting and venting? They also urge their staff not to fly off the handle, but always take a little time and write a quality, measured response if a response is called for at all, good advice. Sometimes it's more suitable to just 'monitor'. For many normal people you could substitute 'monitor' for 'ignore'. This analogy is about soccer. The value of a good analogy can be to find fresh perspectives and see things we're used to looking at in a whole new light. Since the news here is still awash with Manchester City's victory I thought it was ripe for a good analogy. Most professional sports could be seen as a microcosm of the wider business world, but for this case we'll concentrate on football. Manchester City won their first Premiership title in 44 years. 'It's amazing what you can do with just over £1billion', say the more cynically minded. But you can't escape the obvious, for any company resources can make the difference. These clubs are companies, they compete for the premier league and other cup titles, but they also compete in the lucrative Asian and global markets for fans to sell merchandise to and for pay per view sports income. The better their football, the bigger their potential revenue. As in any sector, that wealth of resources still needs to be well managed otherwise you'll come up short against more experienced opposition. One of the most common things people want to know, is how to successfully embed YouTube videos onto their WordPress sites. It's mostly straight forward, but there are one or two tricky issues that you can trip up on. If you add the embed code in the HTML editor, and then switch back into the Visual editor, sometimes your video embed code disappears. Stay in the HTML editor, hit Publish or Update to make it go live, and only edit that post or page in the HTML editor from then on - so make adding the video the last thing you do. If you'd like to get more videos like this, subscribe to our YouTube channel here and to our blog RSS feed here. In this weeks SelfAssemblySites Web News Round Up: Dilbert's app company, a top VC explains how to build a killer value proposition, things Pinterest aren't telling you, business intelligence comes to amateur sport, Facebook IPO share and an explanation of what an IPO actually is. MySpeed from Enounce lets you change the playback speed of Flash video without any loss of audio quality. (No chipmunk sound.) It’s like speed-reading for video. It works with all flash streaming video, saves you time, and for me creates greater engagement with video content. It basically allows you to take control of how you want to best view video online. We often get asked about what tools we use most to enhance our work and time using the web. This is probably the one I use the most. I'll be using MySpeed at some point every single day that my computer is turned on. Like many great advancements it's surprisingly simple but its impact is immediate and a complete change, moving from one level of passive engagement to more customised and active engagement. Click bottom right to view on Full Screen, or click 'YouTube' to view on Youtube page with Chapters.